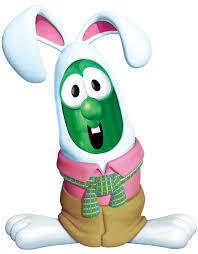 Can we talk about how freakin random “Veggietales” was? It’s a show…about dancing/singing vegetables…that deals with morals…and biblical stories…while also sanctioning odes to manatees named Barbara…WHAT? Regardless, it was a great show. How can you not love Silly Songs with Larry? That, by the way, is the part of the show where Larry comes out and sings (pause) a silly song. Here are the five best Silly Songs: **If you don’t already know these songs by heart, they easily get stuck in your head. You’ve been warned. Doesn’t everyone want a high silk hat? I constantly obsess about my lips, hips, etc. Definitely feel Larry on this point. I was recently told manatees are extremely hairy. What? I totally used to sing this in the car with my little sister. Cebuuuuuuu! Everybody’s got a baby kangaroo.